Stock #45020 Model #321AA On Sale through 9/30/19. Stock #20988 Model #321AB On Sale through 9/30/19. Stock #20989 Model #321AC On Sale through 9/30/19. Stock #45021 Model #321AE On Sale through 9/30/19. Stock #20990 Model #321AD On Sale through 9/30/19. Stock #20991 Model #321AF On Sale through 9/30/19. Stock #20992 Model #321AG On Sale through 9/30/19. Stock #20993 Model #321AH On Sale through 9/30/19. Stock #20994 Model #321AK On Sale through 9/30/19. Stock #20995 Model #321AM On Sale through 9/30/19. 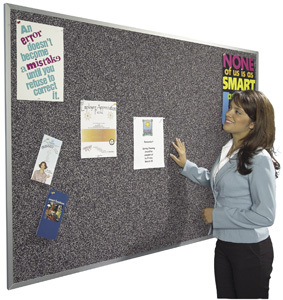 The exceptionally resilient Rubber-Tak Bulletin Boards are environmentally friendly with 100% post-industrial and post-consumer Recycled "green" Rubber. The rubber is moisture-resistant and will not support the growth of mold, mildew, or bacteria, making it an exceptional choice for heath care environments.